Great bayo and glad all worked out for you. When mounted on your No. 1 you can reach into Virginia with it! 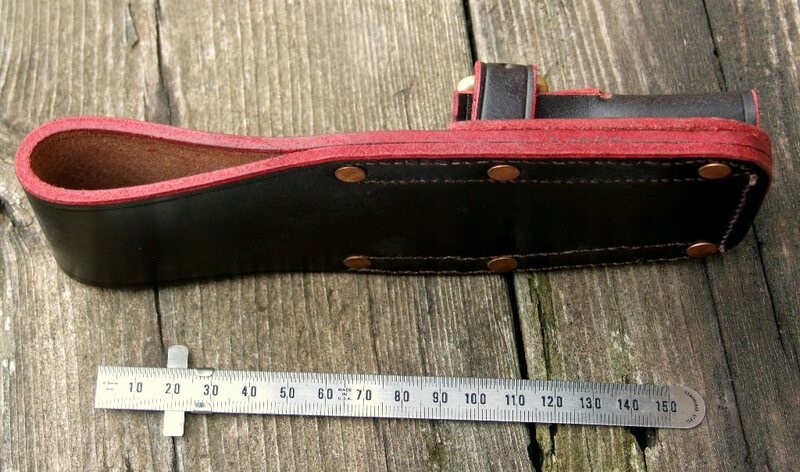 Any thoughts where I could get a frog for my 1907 scabbard? Are you looking for leather or khaki web? I'm looking for one as well. Would a decent repro work for you if I can find one? I have one of the green ones, but its on my No9 bayonet. (Terrible fit, the top of the bayonet mount is nowhere near & below the upper loop!) They're erroneously called Pat 58 bayonet frogs & are post WW2. They are right about it being an absolute bugger to get it to attach though! Can you specify color I wonder? Color does not matter to me...prefer Green>Tan>Blue. I think I'm going to go with this bad boy. Its a repro, but supposedly a well made one. Looks great. Send pics when you get it. 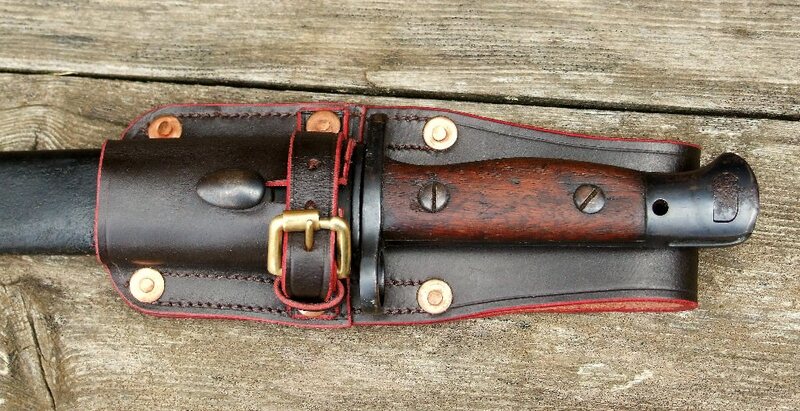 I gave the bayonet & scabbard a bit of a birthday. Nothing too drastic, but the active rust is gone, I ended up having to use a brass brush on a Dremel! The leather has had 2 wipe downs with some Pure Neetsfoot oil & 2 coats of modem day "boot black" equivalent, "Shine-Rite scufff 'n shine". The blue has been touched up a little & the wood wiped with denatured & then given a coat or 2 of BLO. Lots of WD-40 & a razor blade got rid of the fossil tape glue as well. I was going to re-blue the button, but on reflection is normal usage wear being a protruding bit so I left it as is. I know nothing about them, but it looks like a great pickup! I’ll tell you this though ... WHO puts more markings on their arms than the British?!?!? Well the canvas frog fit perfect. ( it is the same one I have on my No,4 spike bayo! 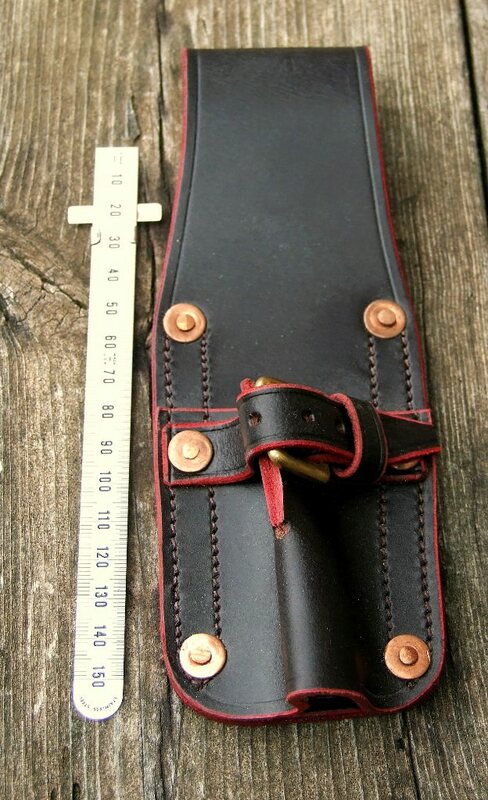 I finally ordered the leather WW1 Repro, now I have to wait. The frog arrived from IMA! I know they have a spotty reputation with some of their in house reproductions but they hit it out of the park this time IMO. Good leather, rivets & stitching. The scabbard got a couple of polishes with Kiwi Neutral polish as well. All in all I'm very pleased with the result.